What you didn't know about the state of divorce today. Divorce is painful, from deciding it's best for you to moving past it and starting over. Today, nearly 45% of marriages in the United States will end in a divorce. But did you know, that contrary to popular belief, the divorce rate is actually declining — and has been since 1981? eLocal gathered stats on six divorce trends — many of which may surprise you. 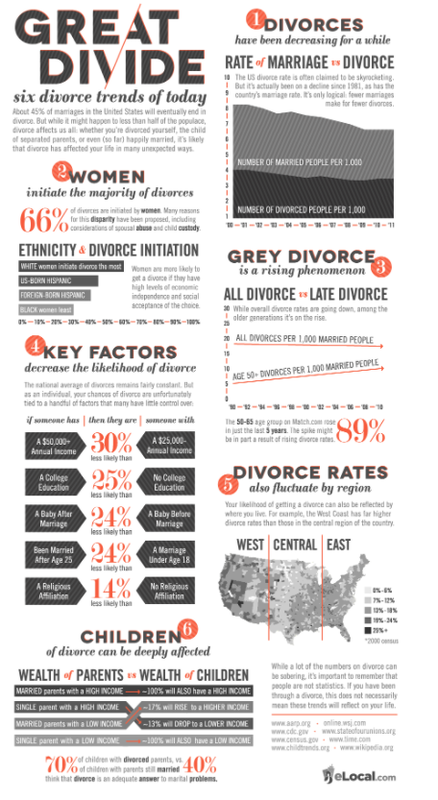 From who is actually initiaiting divorces to the five key factors that can decrease the likelihood of separation, the infographic below has important trends you need to know about the current state of divorce in the country, whether you're happily married or grew up with separated parents.